Though new to us, Shuangye Electronic Technology Company was established 10 years ago in Zhuhai, China. Appearing to be a fairly large company, they manufacture a diverse line of electric bikes, e-bike kits and related accessories. 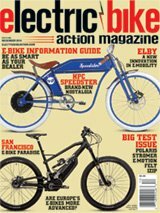 The top of their catalog boasts an assortment of feature-laden mountain e-bikes, and even a dual-motor, fat-tire snow e-bike. The company also produces a variety of folding e-bikes. Unfolding the aluminum Explorer is as intuitive as any, raising the handlebars into place and locking it with a latch that’s also the quick-release mechanism for folding. A similar dual-purpose latch is employed when unfurling the frame and connecting it to the controller extension under the seat. With the battery integrated into the frame, at first glance the best evidence that it is an e-bike is the external cabling. For an economy product, this unit comes fairly well-equipped with a front headlight, horn, LED display, rear rack, front and back mudguards, and a twist throttle, which is on the same (right) side as the trigger shifter for the Shimano seven-speed derailleur. The job of stopping this 39-pounder is given to large front and rear disc brakes. After getting the 36-volt battery to full charge, we mounted for our initial test and took off on a city street to experience the Explorer. About 45 seconds into the ride, as the pedal assist kicked in and we upshifted to feel a decent bit of torque, which is common for lighter-weight folders, then it happened. We rolled over a small bump and the power cut off! After stopping, we pressed the on button. That reignited the system and we continued, but only until another small dip in the road killed the motor—again! With growing frustration, several more attempts were made and met with the same results. Even a slight jarring would simply shut the thing off. Experience told us this was a connection issue. Our inspection revealed wobbly controller prongs going into the battery slots. We tried various ways to fix it, including taping under the prongs and foam padding in the battery casing to try to firm the connection. None of what we tried resolved the problem. When folded, they’re similar in size, though the Sea Breeze is a bit smaller. We came to the conclusion that this e-bike simply was not functioning, and there wasn’t anything we could do about it. It was internal failure that we had no access to. The question was, is this simply a defective unit or perhaps a bigger production flaw that eluded quality control? We still can’t say for sure, but given that the Sea Breeze uses the same setup and did not have this problem, we will give Shuangye the benefit of the doubt (for now). It should be mentioned that on their website the Explorer is listed under the heading of “cheap electric bike.” Well, okay, then. Included mudguards are a nice touch to keep your clothes cleaner on rides. The Sea Breeze appears to be produced from the same mold as the Explorer, featuring virtually identical equipment. The two major differences are that this bike is a single gear and has 14-inch wheels with 2.125-inch-wider tires than the Explorers. This 34-pound unit folds to a tidy 29x16x23-inch shape. The rear-hub 250-watt Shuangye motor seems just enough for this size bike, and it’s the same on both bikes. On the 14-inch Sea Breeze, the rear hub takes up a significant amount of the back wheel. While the controller display uses only the metric system, we got it up to 27 kph (about 17 mph) at full throttle and 28 kph at full PAS. Interestingly, the specs we were given show the power cutting off at 25 kph (15.5 mph). Given the single gear and small tires, we found it necessary to utilize power at all times, which, of course, accelerates the burning of battery juice. While the company rates the per-charge range to be 20 miles, we found it closer to be around 12 to 13. There are five PAS step speeds. Interestingly, the throttle works in conjunction with the levels. That is, you must increase the steps if you want to throttle faster. So, for this bike, the throttle does not override the current level, which gave us a little less control. The telescoping stem allows for great riding positions regardless of height. This e-bike definitely fits into the entry-level category in terms of e-bikes. It’s very basic with a low-distance range, so it could work for local commuting. Given its small footprint, taking it on a train or bus wouldn’t be a problem or storing it at the workplace. Apartment renters with limited space and boaters would find this a good fit, or those who like to take a bike or two in their trunk or backseat. Normally, a twist grip throttle is only the inside of a grip. In this case, it is the whole grip. We found it kind of easy to accidentally open the throttle when going over bumps. Mounting the bike is easy, as the design of the frame gives it a low stand-over height. Turn on the system and the LCD comes to life. Both bikes, despite the small wheels, track fairly well. The 14-inch is a little twitchier, which you’d expect from such small wheels. That smaller bike is one we’d likely never ride a full battery on, but it’s certainly fun on small errands. The small wheels offer much higher torque from a given motor, and though these are 250-watt motors, they pack plenty of punch to get you off the line. We didn’t mind the many stop signs and traffic lights on our rides, as the brakes worked well to bring us to an easy stop, and then the motor got us up and running again tout de suite! Both bikes are easy to live with for an apartment dweller, as they are both reasonably lightweight for an e-bike, as well as having a gusset from the top tube to the seat tube that makes a perfect handle to carry them up or down stairs. Folding it up takes less than a minute, then you can tuck it out of the way. We expect that the problem with the Explorer was a quality-control issue, and likely we got unlucky. But for a distributor based in Pennsylvania, we’d have expected them to want to test the bikes before packing and shipping them to us. Maybe they did, but they never went over a bump in testing. We’ve had this issue with other bikes, and it’s usually an anomaly. That’s what we suspect here, but you’d think a company sending a first bike (or bikes) to us for the first time would’ve checked everything a little more carefully. Being unable to find an MSRP on either the Shuangye website or the U.S. distributor (Cosmo) is another red flag for products from this company. Same goes for the Sea Breeze. Shuangye claims to provide a one-year warranty on motor and batteries, but they’re based in China. Caveat emptor.